There were frogs in his bed and frogs on his head. Frogs on his nose and frogs on his toes. 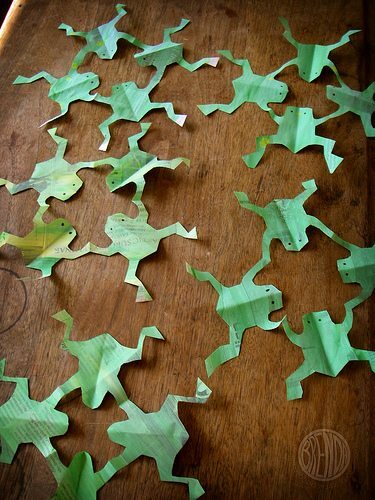 Can you imagine waking up and finding your house covered in frogs? Frogs in your sink, frogs in your pantry, frogs in your breakfast…take a shower and have frogs rain down on your head? Ew! If you celebrate Passover then you probably already know all about those frogs. As the story is told in the book of Exodus, frogs were the second plague that God sent down on the Egyptians to change Pharaoh’s mind about keeping the Jews in slavery. Unfortunately an infestation of frogs did not change his mind and nine other horrible plagues were needed before the Jews were allowed to go free. 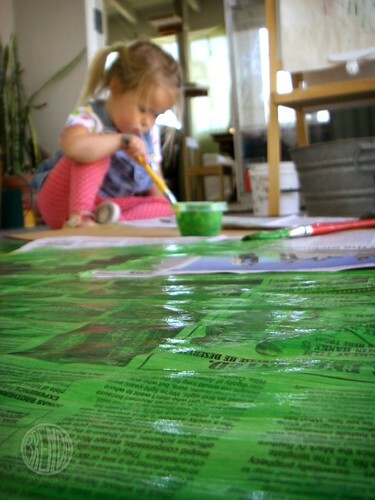 First we made some “frog skin” by painting with cheap kids’ acrylic paint (water-based is safest) on top of newsprint. Big sloppy strokes were fine because I wanted my frogs to have texture. 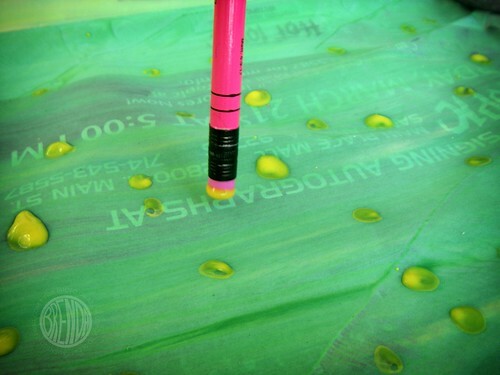 Then we added some warts by stamping a pencil eraser into yellow paint. My daughter added some bigger spots by stamping with a wine-bottle cork. 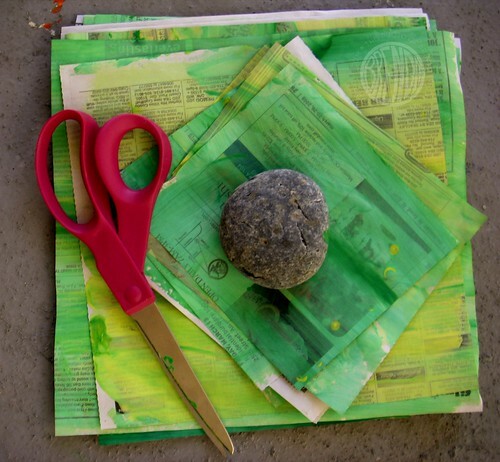 After the paint was dry, I cut the now somewhat-stiff painted newspaper into big squares. I didn’t measure. My squares were roughly 7 inches, though some were bigger and some smaller. I folded my square in half and then in half again, just like you would fold it to make a snowflake. 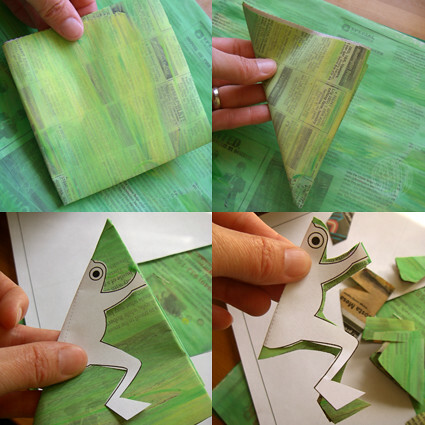 But instead of cutting snowflake shapes out of my square, I cut out half a frog. If you don’t feel confident in your frog-cutting skills, have no fear! I have made you a template that you can download here! It’s pretty easy to follow. Just be careful to cut the top smaller arm all the way off the edge. If you don’t then you won’t end up with frogs that are holding hands. You’ll have a bunch of separated frogs. That’s fine too. Personally, I sort of like my frogs floating down from the sky as if they were doing aerobatics. When you unfold your frog snowflake it should look like the above. You can add eyes with a crayon or marker pen or add ooglie bubble eyes like we did. We always love the ooglie booglie bubble eyes in my house. They make every craft better! 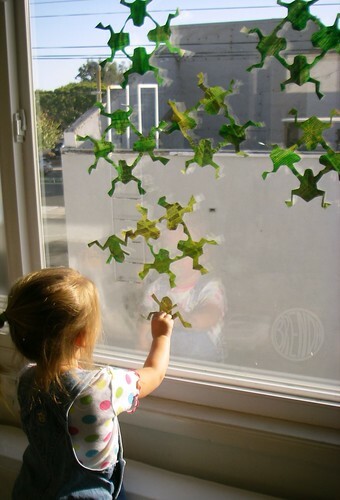 Then we taped them to the window and pretended that frogs were raining down on us. 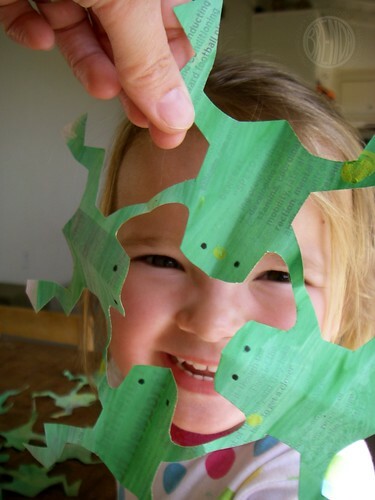 We had a lot of “frog skin” paper left over so we cut it up Eric Carle style and made some more frogs! You can never get enough frogs when you’re recreating a plague of frogs. Frogs here, frogs there, frogs jumping everywhere! *Popular children’s song for Passover titled “One Morning.” Author unknown. Ingenious idea once again. Also thank you for reminding me of the true meaning of passover. I love, love, love this idea. B, you amaze me with the creativity! Editor: Thank you! We will make the correction. We love our community! love it! googly eyes do make everything, don’t they? Brenda, you did SUCH a great job on the post. I’m so proud of you. And those frogs. Too freaking cute for words. I’m going to do this with friends, not as a Passover thing, but because my friend J. is obsessed with all things frog. Oh. My. God. This is unbelievably adorable. It makes me sad that I’m a shiksa. But, hey, I think maybe I’ll do this project anyway – it’s just too cute not to! 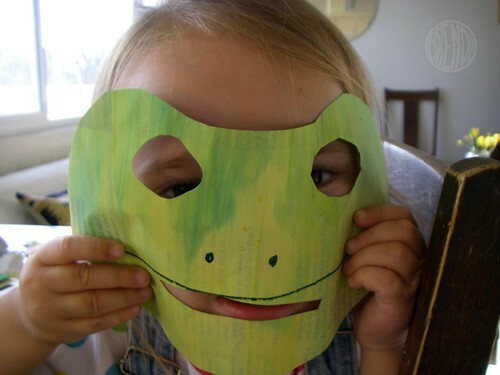 I love the frog idea. I thought you might be interested in my book, Crafting Jewish, it has great Passover crafts (including a great 10 plagues matching game), recipes and party ideas. You can find it on Amazon or at Barnes and Nobles. Have a wonderful Passover! Those are so cute! 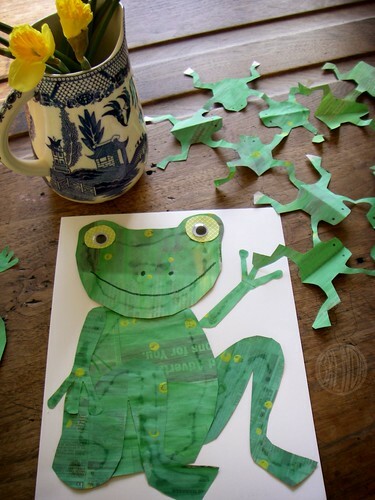 That is a great craft to illustrate the plague of frogs. We made these today! They turned out so cute! Thanks for the idea and template. What a GREAT idea!!! I’m going to use this with the kids in our synagogue’s playgroup next year. Any chance you have a pattern for the cute little frog? yes! Up above you can find a link to the template. Just go to the sentence: “I have made you a template that you can download here!” Press on the word “here” and it takes you to the pattern. Awesome! Will use these ideas to celebrate Leap Day 2016 with my group of young adults with cognitive disabilities! 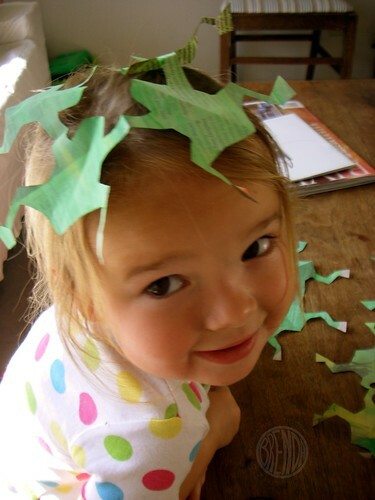 Additional Idea: Draw or paint a pond, lily pads, and lotus flowers on a piece of paper. 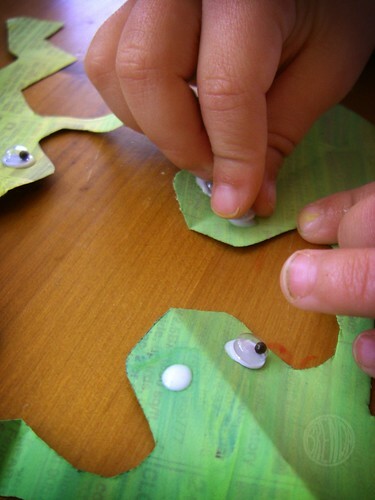 Glue the little paper frogs on top of the lily pads. Leave them bent and just glue feet down so they maintain their 3D look.